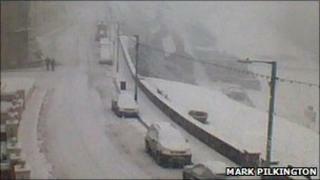 Motorists on the Isle of Man are being warned to continue to take care on the roads because of icy conditions. A limited bus service is operating although several roads were closed on Sunday. The airport is open. The A18 Mountain Road remains closed but a number of other roads reopened on Sunday afternoon after being cleared and gritted. Isle of Man police are warning that any motorists caught driving on closed roads would be dealt with "robustly". "Drivers are to be reminded that roads are closed for their safety," said the Emergency Services Joint Control Room (ESJCR). "Driving on closed roads is extremely dangerous and also invalidates the driver's insurance. "Any drivers found driving on closed roads will be robustly dealt with."